1.Material: Purewool adopts high purity alumina powder, while ordinary ceramic fibers are manufactured from kaolin clay. so the impurities content is less than others. Needling panel which is used in needling links is changed every day to ensure an even distribution of the needling. 3.The tensile strength of PurewoolTM can reach 0.07Mpa, which is 50% higher than ordinary’s. There are 23 production lines for ceramic fiber blanket to guarantee the prompt delivery. We strictly select coal gangue from our own raw material base, and that was calcined in specialized rotary kiln, so our ceramic fiber blanket is 5% lower in slag content than similar products in the market. The needling panel which is used in needling links is changed every day to ensure an even distribution of the needling patterns. Inspection: Supply Lab report for each shipment. 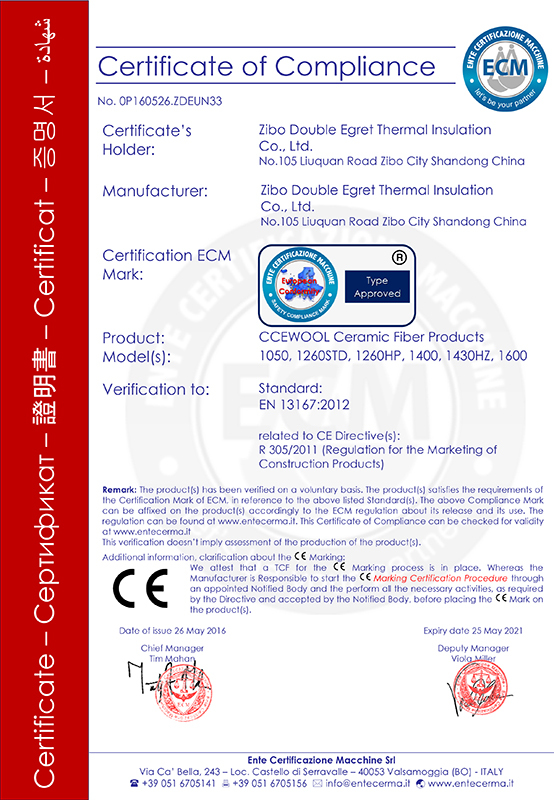 All of our products are certified by the following certificate,CE, TUV, BV and SGS. Packing: Carton box or woven bags. The outer packing of our carton box is made of five layers of kraft paper; the inner packing is plastic bags, which are suited for long distance shipments. The green package design shows the environmental protection idea and that are enjoying great popularity among the customer. Supervision is requested for all the goods; and we also provide loading report and concerning pictures. Why is CCEOOL the top ceramic fiber export brand in China?